We are talking about IPv6 lately because we are running out of IPv4 and we increasingly need more and more IPs for the new area of Internet of Things (IoT). It's a fact that the IP next generation (IPng) protocol and the IPv5 experimental protocol are not so well known by IT engineers but what we should know is about the IPv6 protocol like addressing and subnetting, stateful and stateless autoconfiguration, IPSec support, the new anycast packets, transition mechanisms, etc. I want to highlight transition mechanisms used by main technology companies like Akamai, Google or Cisco because, maybe, as a network engineers, we'll have to participate or migrate IPv4 to IPv6 networks in the future. Dual Stack: This is the most advisable way to migrate from IPv4 to IPv6 because we can do it periodically and progressively. However, all devices should support both protocols, IPv4 and IPv6. NAT64: This is a transition mechanism based on Address Family Translation (AFT), which is a NAT technique similar to the traditional NAT for IPv4. In addition, all devices should be behind a NAT64 router. 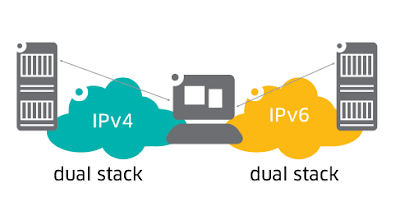 6to4 tunnel: This is another method to connect two IPv6 worlds separated by IPv4, where boundary routers make a 6to4 tunnel against each other. They are going to use the prefix 2002::/16 where the IPv4 tunnel address is identified inside the IPv6 domain. ISATAP: or Intra-Site Automatic Tunnel Addressing Protocol is an extension of the dual stack mechanism, because it relies on dual stack nodes to make the migration, and it also uses tunnels. However, the ISATAP mechanism is often criticized because it depends on the DNS protocol to know the Potential Routers List (PRL). As a result, a layer 3 protocol needs a higher layer protocol to work properly, which is a violation of network design principles. SW1# ipv6 address 2001:db8:1100:1000::/64 eui-64 "intf50"
SW1# ipv6 address 2002:c633:6489::254/16 "tunnel_6to4"
SW2# ipv6 address 2001:db8:b000::/64 eui-64 "intf50"
SW2# ipv6 address 2002:c633:6488::253/16 "tunnel_6to4"
We have heard a lot about there aren't enough IPv4 addresses but it seems that IPv4 is going to stay for a long period of time and, in the meantime, both protocols will have to coexist. Regards my friends, and keep studying about IPv6 too because it will come.